“Let the Dead Bury the Dead” by David Carlson is a gripping mystery surrounding the murder of Father Spiro, a well loved priest of St. Cosmas Greek Orthodox Church. During the service before his death, Father Spiros faltered during the procession, leaving many to question his ability to continue his priestly duties. During the early investigation, it appears that he was a victim of a robbery, with suspects coming from the nearby crime ridden, gang housing area. 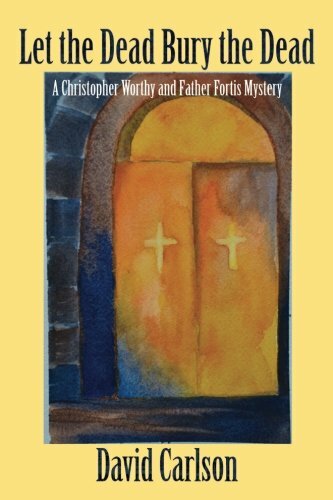 Father Fortis, who is on loan from a monastery, has the difficult task of not only trying to pull the congregation together; he is also a good friend and co-investigator of the detective on the case, Detective Christopher Worthy. Both men believe the killer is someone from the church. The relationship between Detective Worthy and Father Fortis is often funny and challenging, yet they seem to work well together and add colorful commentary to the baffling investigation. It is no secret that Detective Worthy bumbled his last investigation, and his entire department is questioning his skills. The characters provide genuine connection with readers as they are realistic in that readers can relate to their frustration, personal issues, and expectations from others. I found the various settings, from the crime scenes to peculiar parish members, to be well developed and intriguing. Just when one thinks they know who the killer is another twist comes along. David Carlson’s ability to provide readers with a rich and informative description of the Greek Orthodox Church enhances this fictional dramatic murder mystery. His mastery of giving just enough information about the Church gives one a basic understanding of their philosophy without overwhelming details. I also found the portrayal of Father Fortis departure from a monk setting to leading a church to be quite informative while describing his personal struggle to change his perception to a more active role in the church. Having worked with law enforcement for a few years, I found the dog-eat-dog nature of the police department to be true to form. Jealousy, competitiveness and corrupt police are a part of the story that I find quite fascinating. Overall, I thoroughly enjoyed “Let the Dead Bury the Dead” by David Carlson, and highly recommend it.